How often do you review your website? Are you in need of a website revamp? The chances are that none of us do this as often as we should. Websites can easily look tired or out-of-date. They can even appear shabby around the edges if we allow old functions or links to persist. It’s a bit like going in and out of your home. The likelihood is that those little maintenance tasks that need attention just pass you by. That bit of flaking paintwork, or the drip from the gutter. To you, they are always there, so you don’t notice them. It is only when friends or family turn up and comment on the problem that you begin to see it. The same goes for websites. We visit our own company’s website several times a day. We see it more frequently in a week than most visitors do in a year. As a result, we become oblivious to the minor problems; we have found workarounds to them. Plus, if one of the issues is navigation, we don’t notice it because we know our way around the site so well. However, the new visitor doesn’t have our knowledge or experience for the site. Just like an infrequent visitor to your house who notices the dripping gutter as they wait to be let in, newcomers to your website notice the problems that have passed you by. One way you can find out about the way your website is perceived is to ask a group of friends, colleagues, customers – anyone really – to fulfil some particular tasks. For instance, you could ask some people to find something on your site, doing some research. You could ask others to locate something and load it into the shopping cart. Meanwhile, you could get some other people to try and contact you or share a page on social media. The people doing this research for you could then tell you what they found to be a problem. They’ll notice issues with navigation and clarity, that you would not see. Equally, they’d also spot anything that was broken that you have previously ignored. Often, businesses realise that they need to re-look at their website, and so they opt for an often expensive complete redesign. Part of the reason for that is because of familiarity with the site. You see your site every day, and so you are very familiar with the look and layout. After a while, you get bored and think the answer is a redesign. But the person visiting your site for the first time today has never seen the design before and are not like you; they are not fed up with the layout as it is new to them. So, going for a complete re-design may not be necessary. New visitors could think your design is just perfect. Hence, what you really need to do is probably just “tidy up” the website. In fact, a website should be viewed as something that is never finished. It is, like your home, something that always needs re-decorating, updating, maintaining and altering. Both your home and your website are on-going, never-ending projects. As those articles explained, taking on tasks to improve things can have psychological benefits. 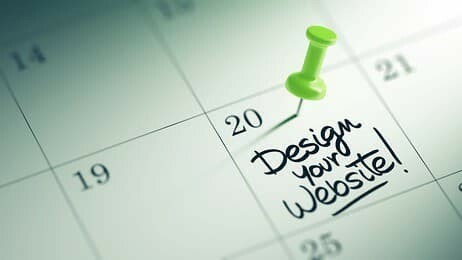 If you do the same kind of thing and constantly attempt to revamp your website, not only will your visitors benefit, but so will you and your team. The alternative is a sudden need to re-do your entire website once every couple of years, which is just a source of stress. I`ve found it`s not often the website that is the problem, its the exposure that their site is getting, i.e. they are not spending money to target these customers. Many people forget that a website is just the foundation of your online marketing activities, you need to build social media platforms, PPC, SEO and email marketing to be effective and create a steady stream of leads.